My submission for illustration friday's "Spring" topic. 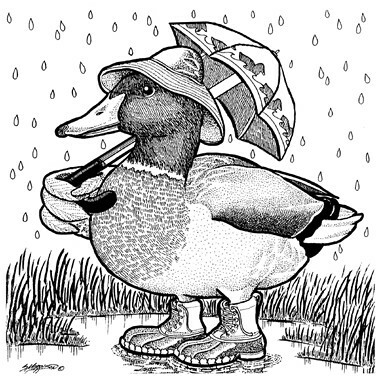 I like that he (or she) is wearing those "duck" boots! Nice touch! Those boots are a really nice touch. And I love that monster. Amazing what you can do with a sharpie. Very cute and professional looking. Great illustration for spring. This made me smile out loud! Lovely drawing! The perfect illustration for Spring!! Where did he get his boots? this is awesome! now i must browse the rest of your blog. Wonderful! (I once illustrated an alphabet and did more stippling than I ever want to again - so I really appreciate your detailed textures here - LOL!) And yes, duck boots - LOL! Great drawing this is, the boots make me smile! He's really cute. Beautiful drawing. What a fun idea! Beautifully done. You're a great drawer - I think you know it - and I'm a fan! I like your style, and this duck is a nice spring-duck. Amazing pen work and a delightful illustration. How long does it take you to do a piece like this?